CROSSPOSTING FOR THIS LITTLE DOXIE IN NEED***SPONSORED!!!! CONTACT LISA HESTER AT lisahester@bellsouth.net IF YOU CAN SAVE THIS LITTLE ONE....IF YOU CAN NOT HELP, PLEASE CROSSPOST FAR AND WIDE...THANK YOU. Sponsor $$ available for any rescuer who saves this sweetie. Lisa will stay up until at least midnight on PTS deadline TONIGHT 9/29 for YOU to contact her. Please call or e-mail her ASAP! 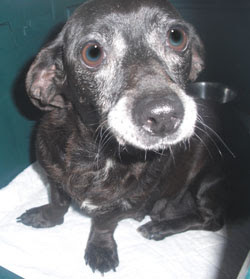 108039 Darling senior Doxie is super sweet, quiet and calm. She loves to be held. She also does nicely with other dogs. She has a mammary tumor. She weighs only 15 lbs. These sweet pups are set to be PTS Monday at dawn at the Murray Shelter in Chatsworth, GA just north of Atlanta and just south of Chattanooga , TN ). We MUST know by THIS Friday a.m. 9/29 if they have rescue. Please help them live. NOTE: Free transport to Atlanta provided. Transport contacts to the northeast and midwest available. Please e-mail or call ASAP as time is of the essence! Your rescue help is greatly appreciated! !